Niall Horan, born 13 September 1993, is from Mullingar, County Westmeath, Ireland. He is a pupil at Coláiste Mhuire, Mullingar, a boys’ CBS secondary school. Zayn Malik, born 12 January 1993, is from West Lane Baildon, Bradford, England. He is a pupil at Tong High School, a state comprehensive school. He is of Pakistani descent. His audition was initially not broadcast, but was shown after the series ended on companion show The Xtra Factor. Malik was noted for becoming nervous in bootcamp, and when he was told he had to dance, he decided to remain backstage, effectively running the risk of elimination. Cowell noticed Malik missing from the dance routine and went backstage and convinced him to return. Liam Payne, born 29 August 1993, from Wolverhampton, West Midlands, England is a music technology student at City of Wolverhampton College, a Further Education College. Payne had auditioned in 2008 to The X Factor’s fifth series when he was 14 and reached judges’ houses, but Cowell thought he was not ready for the competition and asked him to come back in two years. This time Payne auditioned singing “Cry Me a River” and received a standing ovation from the audience and Simon Cowell. Harry Styles, born 1 February 1994, is from Holmes Chapel, Cheshire, England and is a pupil at Holmes Chapel Comprehensive School, a state comprehensive school. Styles was the lead singer for the band White Eskimo with band members lead guitarist Haydn Morris, bass guitarist Nick Clough and drummer Will Sweeny. Styles auditioned with “Isn’t She Lovely” and received positive comments from two of the three judges present at his audition, with Louis Walsh having doubts on whether he was ready to progress in the competition. At bootcamp, he sang “Stop Crying Your Heart Out” before being rejected and put into One Direction. Louis Tomlinson, born 1 February 1994, is from Doncaster, South Yorkshire, England. He was a sixth form student at Hall Cross School, a state comprehensive school and previously a pupil at The Hayfield School, a state comprehensive school, before that. 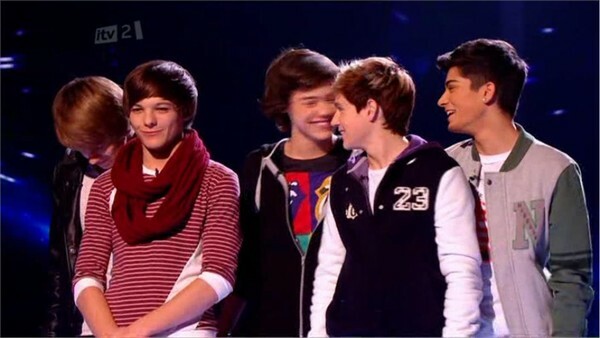 In 2010, Niall Horan, Zayn Malik, Liam Payne, Harry Styles and Louis Tomlinson all applied as solo candidates for the 2010 of The X Factor, but failed to qualify for the “Boys” category. After suggestion by guest judge Nicole Scherzinger, the five were put into a band, thus qualifying for the “Groups” category. After the elimination of F.Y.D., Diva Fever and Belle Amie within four weeks, they were Simon Cowell’s last act in the competition. One Direction finished third behind runner-up Rebecca Ferguson and winner Matt Cardle. One Direction’s debut single “What Makes You Beautiful” was released on 11 September 2011. It peaked at #1 on the UK Singles Chart. Their second single, “Gotta Be You”, was released on 13 November 2011, followed by their debut album Up All Night on 21 November.